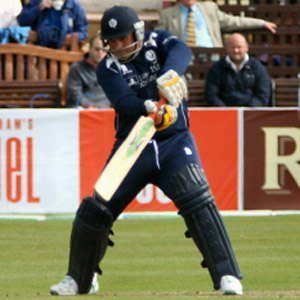 He is one of the inaugural players to be awarded a Cricket Scotland contract, and has captained Scotland in international play. He began his professional career - both domestically and overseas - while living in South Africa, before moving to Scotland when he was 23. In 2003, while playing for Glenrothes, he accomplished the impressive feat of hitting a century off of a mere 43 balls. He was born in Salisbury, Rhodesia. At the 2007 World Cup he captained Scotland against South Africa and rival captain Graeme Smith.